The NAWDEX period was characterized by dynamically-active atmospheric circulation including a large variety of weather situation such as an extratropical transition of a tropical cyclone, deep extratropical cyclones associated with intense WCBs, small-scale tropopause polar vortices, cut-off formation from breaking wave, atmospheric rivers as well as downstream impact over the Mediterranean area. At larger scales, the campaign was dominated by a long-lasting blocking situation which brings interesting predictability issues to investigate. 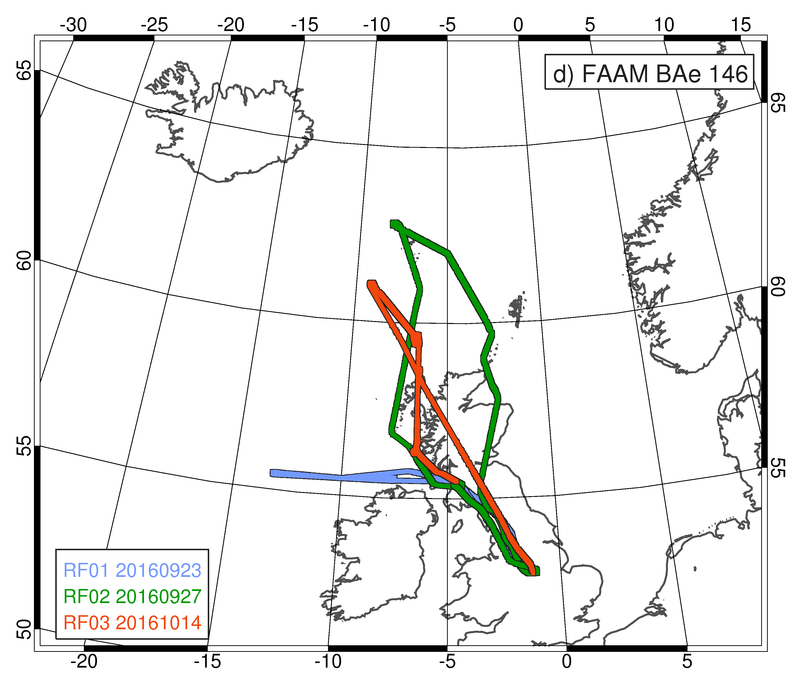 Intensive observation periods (IOPs) of NAWDEX are very exciting cases because the observed phenomena are well-known to create a loss of predictability in mid-latitudes (e.g, extratropical transition of a tropical cyclone, blocking, cut-off). Four aircraft from three different countries were deployed: the German High Altitude and LOng Range Research Aircraft (HALO), the Deutsches Zentrum für Luft- und Raumfahrt (DLR) Dassault Falcon 20, the French Service des Avions Français Instrumentés pour la Recherche en Environnement (SAFIRE) Falcon 20, and the British Facility for Airborne Atmospheric Measurements (FAAM) BAe 146. 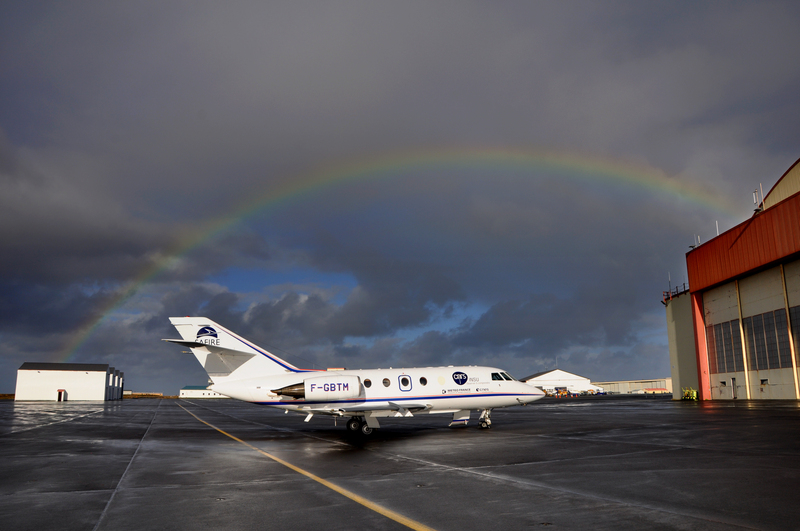 The deployment of the SAFIRE Falcon 20 was funded by ESA, CNES and EUFAR. The French component of the field campaign was co-funded by CNRS/INSU/LEFE, IPSL and Météo-France. Table 1 is a summary of the SAFIRE flights that were conducted during NAWDEX. 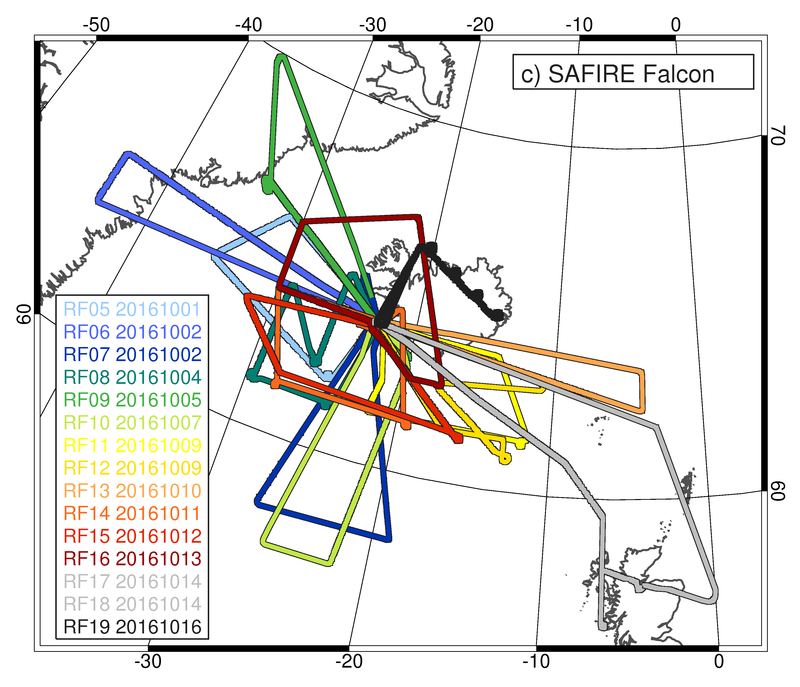 The aircraft has an endurance of 3.5 hours and all the SAFIRE flights were done in the Greenland-Iceland-Scotland area. 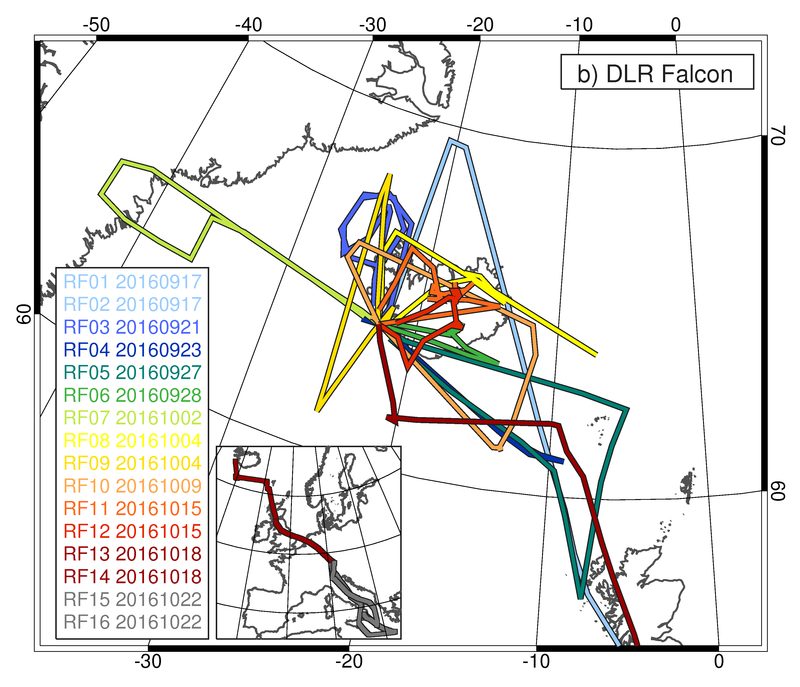 During that almost 2-weeks period, 15 scientific flights were conducted for a total of 46.5 flight hours. 59 dropsondes were launched and their measurements are complementary to the remote sensing platform RALI on board the SAFIRE F20 aircraft. RALI includes a multi-beam 95-GHz Doppler radar RASTA (RAdar SysTem Airborne), a high-resolution lidar LNG (Leandre New Generation) and an infrared radiometer CLIMAT. The lidar and radar were both developed at LATMOS, one of the partners of the present project. The radar has 3 antennas looking down that allow to retrieve cloud winds which is particularly welcome to study warm conveyor belts. 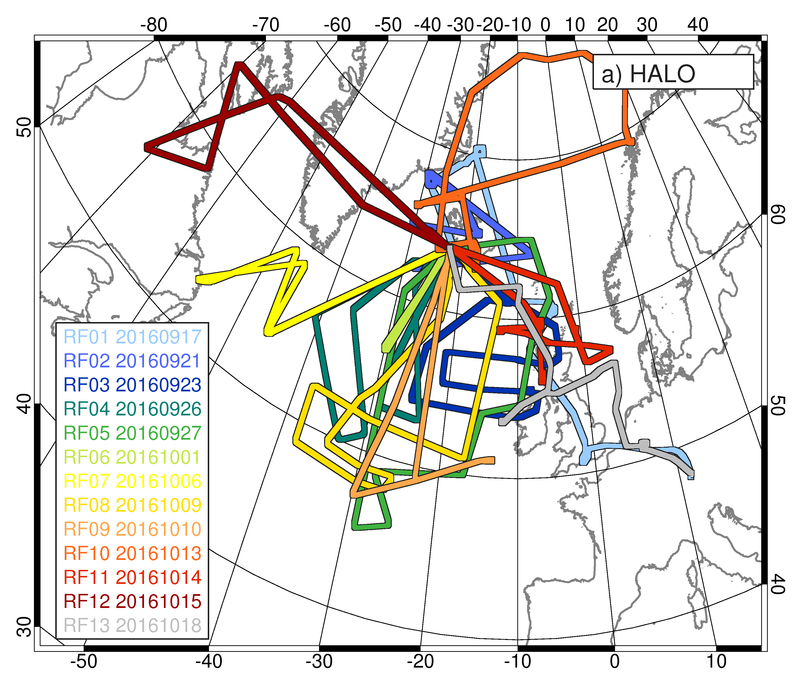 RALI also provides information about contents in cloud water and ice, and cloud microstructure (precipitating/non-precipitating) occurring in the different sectors of an extratropical cyclone.